Jack Lenor Larsen collaborated with artists, designers, and craftspeople all over the world. The collaboration between Larsen and Richard Landis was unique in that the two men literally designed the face and reverse of the same fabric. Richard Landis received formal training in art and design, but was essentially self-taught as a weaver. He believed hand weaving, in particular the double cloth structure, offered him the exacting control he sought in the exploration of form and color, and he worked almost exclusively in that format to create systematic compositions of modular elements of color and geometric forms. 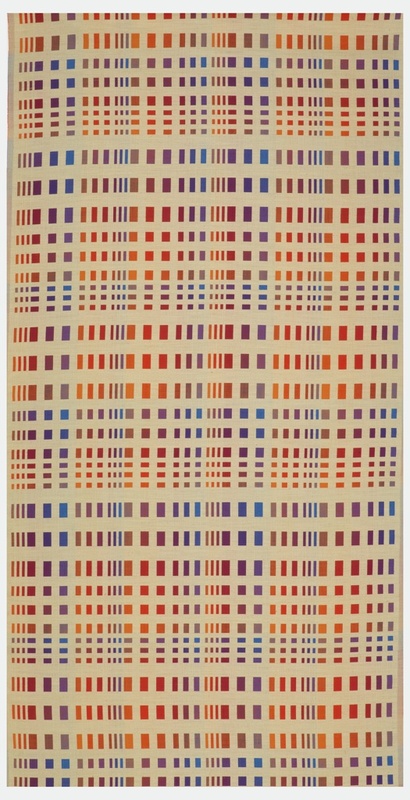 Nucleus (1973), also in the museum’s collection, is a superb example of Landis’s technically and aesthetically disciplined hand woven double cloth. Landis sent Larsen samples of his weaving after seeing an exhibit of the designer’s work at Arizona State University in the late 1960s. According to Landis, Larsen responded immediately and enthusiastically. Larsen was captivated by the systematic use of color and the rigorous integration of weave structure and visual program in Landis’s double cloth. The two then worked together on a design for a commercial furnishing fabric that would become one of the company’s most successful woven upholsteries. On the front face, blocks of color in a spectrum of 21 shades, created from 6 different color threads, appear in a repeating grid of “windows” against a solid-colored beige background. For further visual interest, the windows are of 9 different sizes, repeated sequentially. All possible color combinations appear systematically across the full range of graduated rectangles. The subtle symmetry of the geometric forms and the juxtaposition of tonalities evidence Landis’s hand in the design. But it was Larsen who chose the palette of bright, fully saturated reds, orange, blue, and violet that fit perfectly with the lively color schemes favored in interiors in the 1970s. Maleyne M Syracuse recently received a Masters of Arts degree in the History of Decorative Arts and Design from the joint Parsons New School for Design/Cooper Hewitt Smithsonian Design Museum program. She serves as President of the Board of Directors of the Peters Valley School of Craft and Treasurer of the Board of the Textile Society of America and works part-time as an independent art historian/curator. Textile, Landis II, 1973. linen, polyester. Gift of Jack Lenor Larsen, Inc.. 1977-67-6.